Sturm, Ruger & Company, Inc. (NYSE: RGR) is pleased to announce its very first offering from the Ruger® Custom Shop - the SR1911® Competition Pistol. 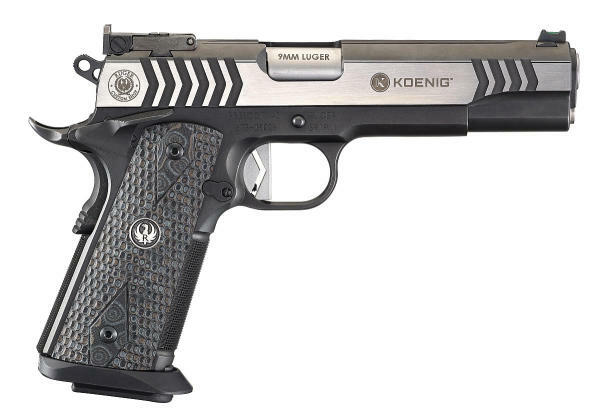 Over the past year, the Ruger Custom Shop has worked closely with professional shooting team captain and world champion competitive shooter, Doug Koenig, to develop the first Custom Shop SR1911. This full-sized 9mm pistol is the ideal SR1911 for competitive shooting in IDPA, IPSC, USPSA, Bianchi Cup, Pro Am Shooting and Steel Challenge disciplines. "I am so grateful to have had the opportunity to work hand-in-hand with Ruger's first-class engineers to develop this pistol," said Doug Koenig, Team Ruger Captain. "New and accomplished competition shooters alike will find this to be one of the finest, feature-rich 1911 pistols available. This firearm was designed and built to win." This SR1911 leaves nothing to chance, featuring the precision-machined Koenig Shooting Sports low-mass hammer and competition sear. When combined with the custom flat-faced trigger shoe, precision-machined disconnector and hand-tuned sear spring, you can expect a match-grade, crisp and clean break with every trigger pull. The hand-fitted slide and frame provide a remarkably tight, yet smooth, action. The competition barrel features a polished feed ramp, fitted barrel lug, target crown and unique 1:16" slow twist to increase accuracy with lighter weight match bullets. The Custom Shop SR1911 sports a black nitrided stainless steel frame trimmed with a 25 lines-per-inch checkered front strap and matching checkered mainspring housing. The addition of Hogue® G10 Piranha grip panels provides for a superior grip, while the trigger guard is undercut and blended for a comfortable high hold designed to reduce muzzle flip. The stainless steel slide has an anti-glare, black nitrided top with precision-ground slide serrations, revealing an attractive, two-tone finish. Finishing touches include a machined aluminum TechWell magazine well for lightning fast reloads, ambidextrous safety, a fiber optic front sight, adjustable serrated rear target sight, beavertail grip safety, extended magazine release, forged slide stop and integral plunger tube, along with intricate cosmetic details to give the shooter maximum performance, comfort and styling. This pistol ships in a waterproof, fitted hard case and includes two, 10-round competition magazines, a Ruger Custom Shop Certificate of Authenticity, challenge coin, cleaning cloth, gun peg and decal. The Ruger Custom Shop's uncompromising attention to fine details ensures a world-class level of performance suitable for the most demanding competitors and shooters.